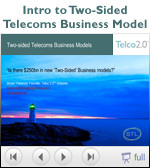 The fourth Telco 2.0™ Executive Brainstorm, on 16-17 April in London, builds on previous events and new research to interrogate the concept of the 'Two-sided Telecoms Business Model'. For upstream players (brands, content owners, merchants, ASPs, and government) - to use untapped telco assets and capabilities to more efficiently and effectively serve their customers. Some operators are experimenting with more open platforms and new business models. However, this activity is rooted firmly in their technology departments. The commercial structures needed to reap the benefits for all parties are not yet in place. The fourth Telco 2.0™ 'Executive Brainstorm' articulates clearly, for the first time, the commercial opportunity around two-sided telecoms business models. Incorporating its unique 'Mindshare' interactive format, the event provides a structured and creative environment for invited execs to consider the practicalities of the opportunity. Telecom-Media-Technology sector - specify a coherent way forward for cross-sector collaboration. Investors - understand how the TMT sector has plenty of growth and new markets to conquer. The format is described in more detail here. The agenda is here. In addition we will be running a small exhibition showing demonstrations of the most cutting-edge 'Telco 2.0™' products, tools and techniques, a special ‘Mash-Up’ demo session, and evening networking parties. After the event, on the morning of 18th April, we will be holding an informal ‘Meet the Telco 2.0 Analysts’ open morning to discuss some of their latest research output.